A devout dynasty player in the heart of mock draft season, my penchant for age discrimination is often quite apparent when reviewing my final rosters. Admittedly, it’s a tough habit to break, always chasing upside and The Next Big Thing at the expense of proven commodities of yesteryear (wait, this is probably not the smartest thing to say when you’re 36 years old and married). Well, not today. There is plenty of value to be found among players north of the dreaded “old” age of 30. On the heels of PFF’s list of the best players in the league over 35 years old, what better way to explore said value than to compile an All Over-30 fantasy squad? My picks below are listed with consensus ADP along with their age by the end of the 2018 season. Excluded are players who will be 30 or under by season’s end. So, no Antonio Brown or A.J. Green or LeSean McCoy. That’d be too easy, anyway. Considering each of the top six fantasy quarterbacks from 2017 are 29 or older, this spot is essentially a pick-‘em. So, for those who prefer Tom Brady, I won’t argue. But if we’re starting an over-30 fantasy squad, my pick is our consensus top-ranked QB, Rodgers, who posted QB1, QB2, and QB8 fantasy finishes over his previous three healthy seasons. The decline of running backs after the age of 30 is well documented, but that doesn’t mean fantasy players shouldn’t pounce when the price is right. Given Lynch’s current ADP, the price is right. Since 2013, Lynch has forced 287 missed tackles as a rusher. That’s 75 more missed tackles forced than the next-closest running back (Le’Veon Bell), way out in front even despite the fact Lynch sat out all of 2016. In standard scoring, he (somewhat quietly) finished as the RB18 this past season despite missing a game. In doing so, he saw 3.1 yards of his 4.3 YPC average come after contact, finishing with 891 yards and seven TDs on 207 carries. 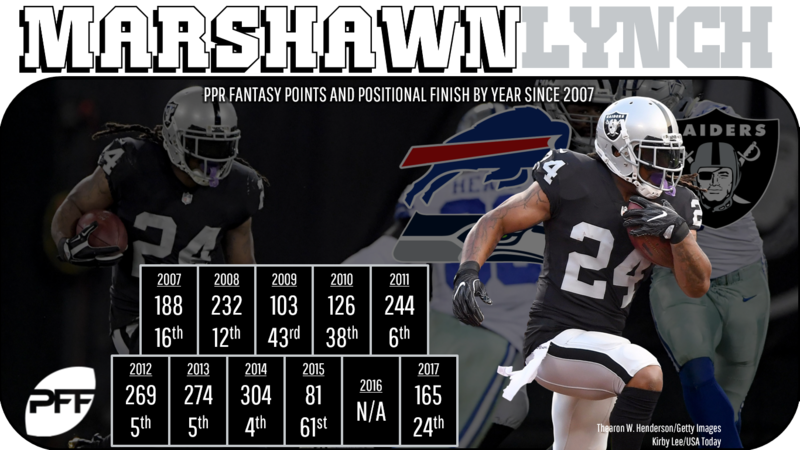 He also averaged 0.37 fantasy points per opportunity, besting eight RBs who finished ahead of him in fantasy scoring, including the likes of Bell (0.31), LeSean McCoy (0.33), Ezekiel Elliott (0.34), and Devonta Freeman (0.35). Let’s get the glaring caveat out of the way first: the Detroit Lions have not had a 100-yard rusher in a game since 2013, a remarkable span of 68 straight games. Understanding that the streak encompasses a variety of offensive personnel and schemes that have since moved on, it’s worth acknowledging the fantasy RB ceiling in Detroit is only so high. Things only got muddier after the team drafted Kerryon Johnson. Still, newly acquired Blount is coming off a season in which he finished tops out of 28 qualifiers in yards after contact (3.56) and third in elusive rating (72.8). He’s also two years removed from a league-high 18 rushing touchdowns. In terms of value, Blount is currently outside the top-50 in our staff’s consensus PPR rankings, nine spots behind his rookie teammate who has yet to put on pads. While best viewed as a late-round depth option for season-long leagues, he makes for a viable RB2 in a pinch whenever the Lions’ matchup projection calls for a positive game script. 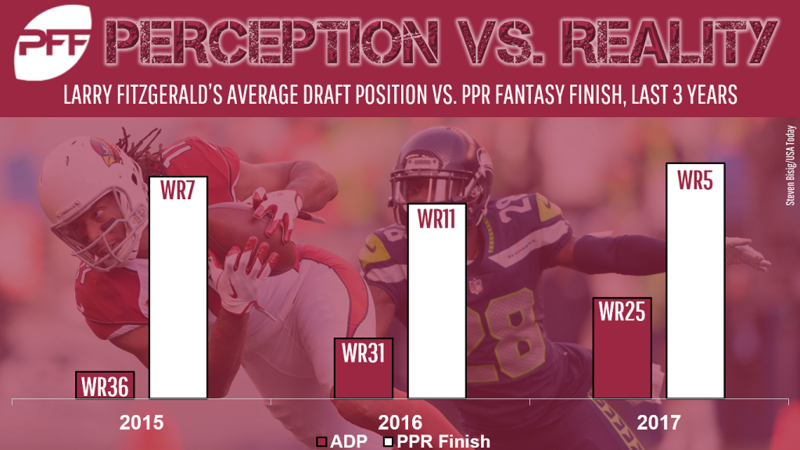 Point blank, Fitzgerald is arguably the most unsung WR1 in fantasy these days. Sure, conventional wisdom says not to hitch your wagon to a 35-year-old skill position player. But at the end of the day, Fitzgerald has finished seventh, 11th, and fifth among fantasy wideouts over the past three years despite an ADP outside the top-24 entering each of those seasons. Sure, Fitzgerald’s current ADP as a mid-WR2 is probably fair, if for no other reason than the uncertainty surrounding the Cardinals’ QB situation. And I’ll admit, I often pass over older options on draft day. But if you share that same tendency, know that it’s a mistake to discount Fitzgerald at his current ADP simply because he might possibly start to show his age. He’s suited up for every single game over the past three years and averaged a 108-1,131-7 line in that span. Barring a breakout camp from rookie Dante Pettis, the San Francisco 49ers will likely enter the season with the same starting receivers from 2017. Marquise Goodwin (WR35 ADP) was a pleasant surprise, as he saw a career-high 70 percent of the offensive snaps and finished just shy of 1,000 yards with a couple of TDs on 99 targets. But don’t forget about Garcon, who was on pace for 80 catches and 1,000 yards before suffering a season-ending neck injury halfway through the year. Garcon was right around his career 80-percent snap share prior to getting hurt, but most notably, he was catching passes from Brian Hoyer and C.J. Beathard. One year removed from a 79-catch, 1,041-yard campaign, Garcon now gets to be a primary short-to-intermediate option for Jimmy Garoppolo in a Kyle Shanahan offense. Last offseason, the Philadelphia Eagles acquired Torrey Smith to stretch the field and take the proverbial lid off opposing defenses. That never quite materialized, as Smith played 16 games and finished with all of 430 yards on 36 catches, marking his third straight season below 40 receptions. He also dropped three of his eight catchable deep targets (20-plus yards downfield). Wallace may be no spring chicken, but he was quietly productive in 2017, hauling in all nine of his catchable deep balls and ranking inside the top-10 among WRs with at least 20 deep targets in both passer rating (101.8) and catch rate. Wallace and Smith ran virtually the same number of routes (455 to 442), yet Wallace averaged significantly more yards per catch (14.4 to 11.9) and per target (8.6 to 6.8), and he also held a 0.33 to 0.20 edge in fantasy points per opportunity. Oh, and he’ll now be catching passes from Carson Wentz (or Nick Foles). Jonnu Smith is expected to see his playing time increase in Year Two, but don’t count out Walker just yet. Walker earned PFF’s fourth-best TE grade this past season, finishing with a 74-807-3 line while playing 74 percent of the Titans’ offensive snaps. A favorite option of Marcus Mariota’s, Walker has seen 100-plus targets in each of the past four seasons and averaged 74-896-5 in that span. What’s more, the Titans largely kept their receiving corps intact. The offense will now be guided by Matt LaFleur, who guided the Rams’ top-scoring unit a year ago. That’s good news for Walker, who finished as the No. 4 fantasy TE in PPR in 2017 and also posted the fourth-best catch rate.